Our nex story takes us 170 kms north of Oamuru to Christchurch and the farming business of Brendon Dolan and his family who farm 520 ha and a 1200 dairy cow herd. Brandon and his family are no strangers to the Massey Ferguson brand, indeed he was brought up around it as his father ran Massey 410 510 525 and then the Brantford built 750 models, Brendon agrees the company had a huge following on South Island just about all their neighbours at one time ran Massey tractors and combines, but alas that is not the case today ,however as we have seen here on Yellowswirl some farming enterprises still run these old veterans in what is a very difficult and cost conscious business that is reflected globally today infarming. 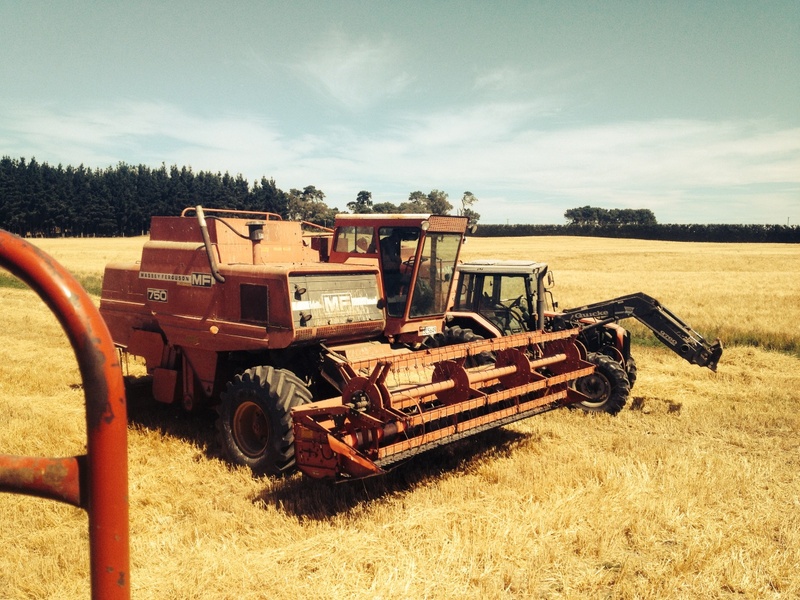 Brendons list of current machinery is very impressive and it is put to good use every season to maintain their farming business, his combines consist of 2x Massey 750 red cab white roof early models serial numbers 9000/ 11291 purchased in 1990 the combines are kept in good working order, spares are difficult in South island today but Brendon says their is no problems getting parts from the usa. Another big factor over more modern equipment is obviously the cost of of ownership but with that said breakdowns and repairs can be handled by themselves and running more than a single high capacity combine as so many enterprises do today running more than one combine means that the harvest continues in the event of a single machine breakdown. As Brendon points out these Canadian built combines were very well built and capable of high hours and he doesn't envisage changing his combines in his working life in fact he has just purchased another later 865 which he points out needs an overhaul and it was destined for the Scrapman but this ex uk registered red top combine late build will hopefully join the others next season to speed up the capacity a little. The serial number of the 865 is 20351 a fairly late build that was imported over about 10 years ago. Brendans recent purchase a 1986 865 this 1986 machine will require an overhaul but the cost of this will be far less than running newer kit and all the cost implications of specialist dealer servicing and repairs that will no doubt follow on. 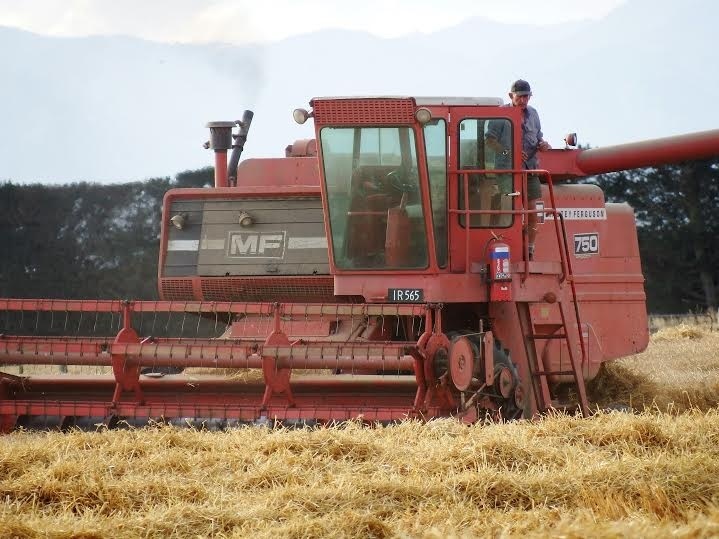 This combine is fitted with a safety handrail around the engine bay for safety, it's also an 85 series machine which would have all he modifications of the last of these models also. 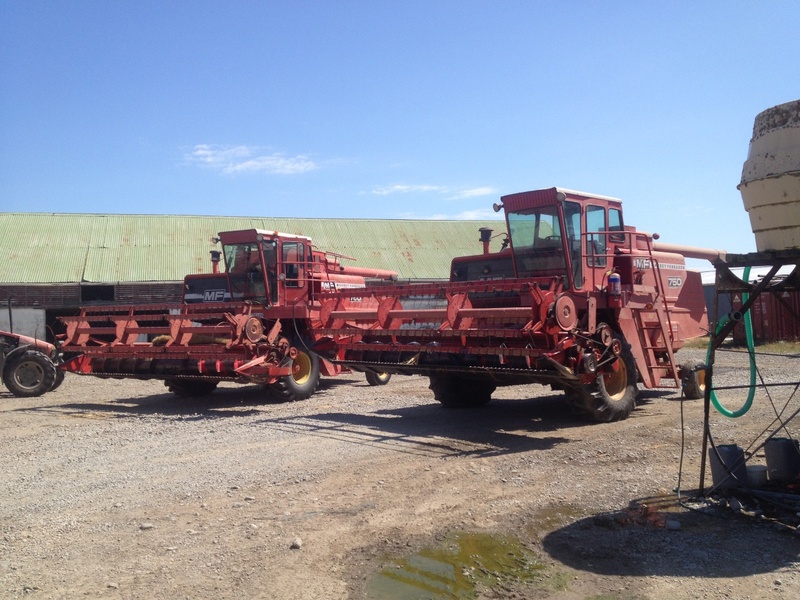 Brendons 2 veteran 750s undergoing harvest preparation. 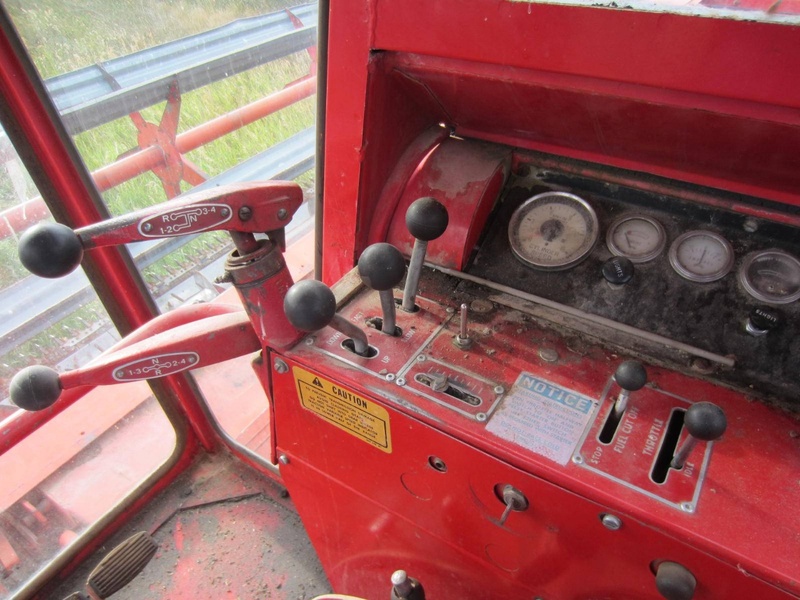 Despite their age and faded paintwork these combines are maintained and serviced every season to reduce the risk of breakdown in the field, and this would apply to any age of combine new or old but quite a few owners ignore this and eventually pay the price at peak harvest time. 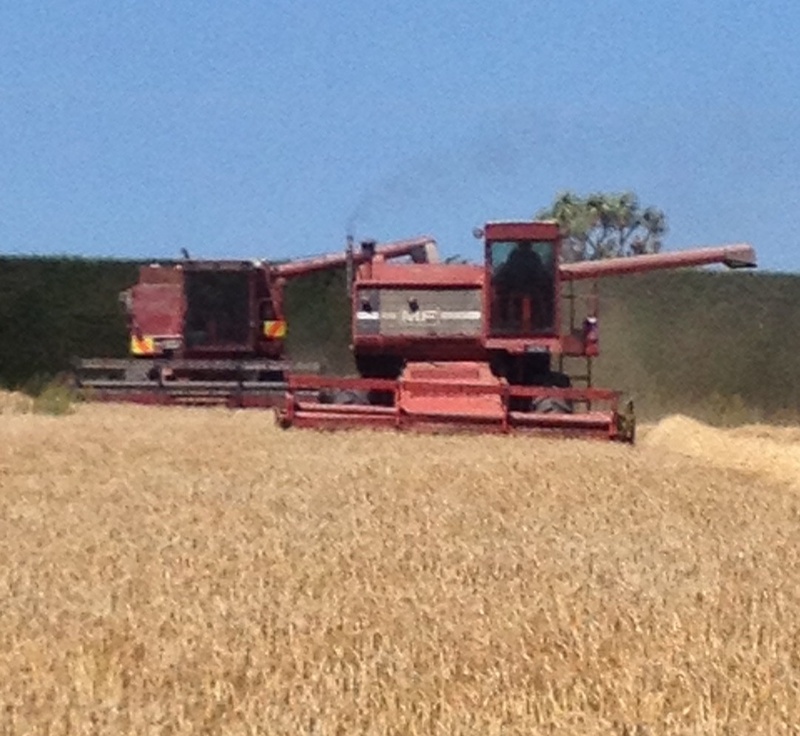 The 750 in action on Brendons irrigated wheat crop followed by their Case 1460 rotary which has been on the farm for many years and now is being extensively rebuilt again to prolong its working life. A shot from the steps of the other 750, unloading another tank full of grain. 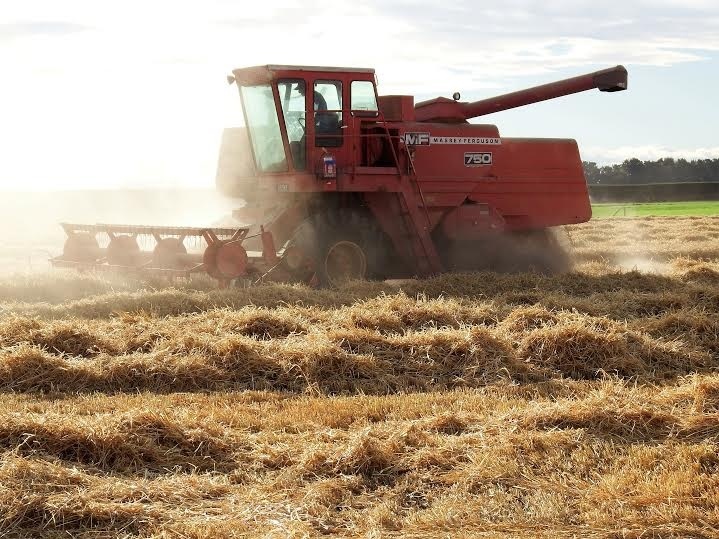 An atmospheric early evening shot , this is a classic massey combine in all its glory eating it's way through another never ending growing crop. Awaiting another trailer, and a chance to survey the days progress. Control layout of the early 700 series combines. 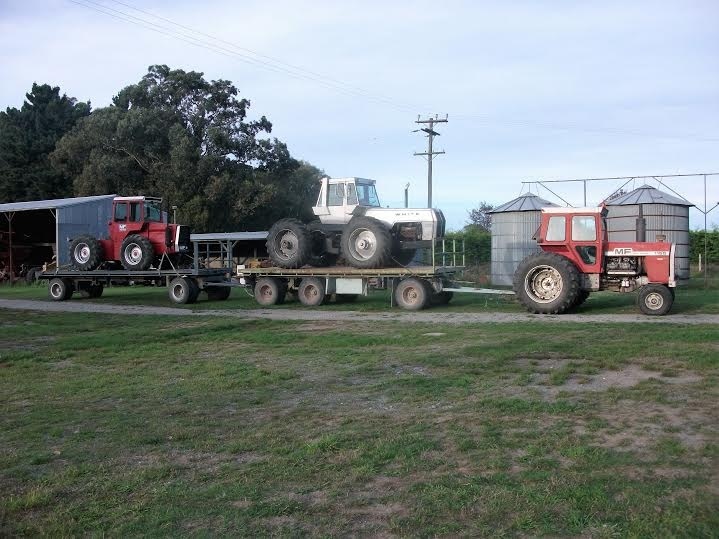 Not only does Brendon rely on his ageing fleet of Massey combines but he also puts his faith in his sizeable collection of tractors that continue to serve the family farm well. The list is very impressive. A 1155, 2680, 1200, 188, MH 745, 65, 3650, 3095, 3060, 4245, 8240, 5460, and also a White articulated 4-150 reputably the only one in New Zealand..
As Brendon points out some of these tractors have been on the farm a long time and have worked alongside the newer models, earning their keep still! And the cost of ownership is very minimal, as we strive to keep everything in top mechanical order by regular inspections and servicing, after all its the life blood to our business. We our also well supported here with the local Massey dealership which is still vital as despite the modern way of laptop engineering, the local dealer is still something farming businesses rely on, but the world and technology is changing and fewer dealers are now encouraged by manufacturers and customers particularly farming businesses see this as something of concern for the future. 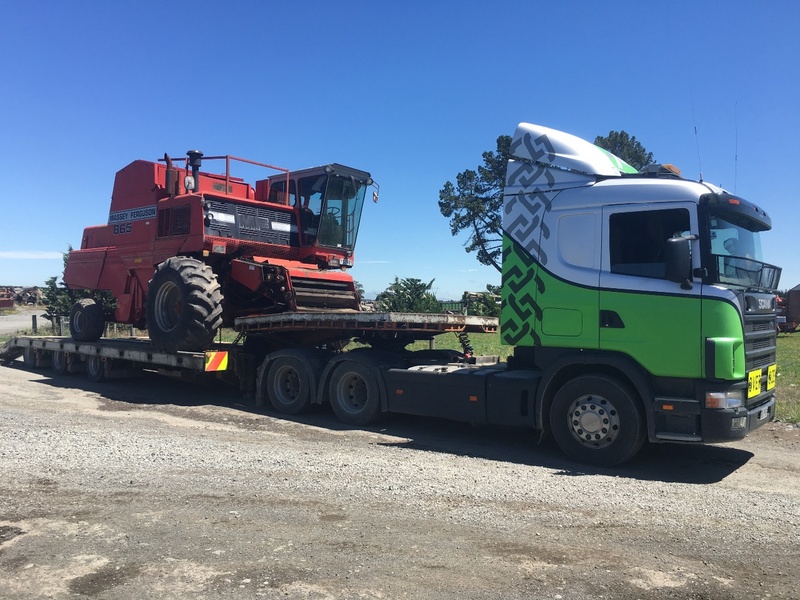 Brendons mighty 1155 hauls the white and MF 1200 over to another part of the farm for the busy season ahead. 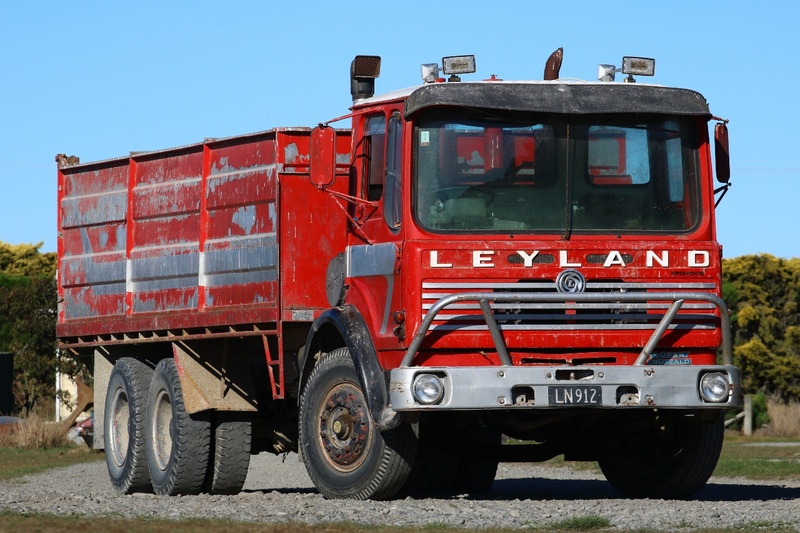 This Leyland buffalo is one of the grain carting trucks the family uses every year for the longer distance journeys. More news and pictures from New Zealand shortly.